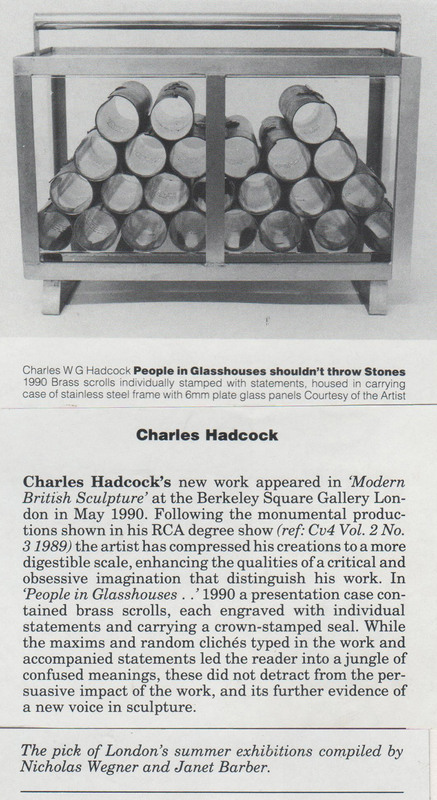 Article Text: Charles Hadcock’s new work appeared in ‘Modern British Sculpture’ at Berkeley Square Gallery London in May 1990. Following the monumental productions shown in his RCS degree show (ref: CV4 Vol. 2 No. 3 1989) the artist has compressed his creations to a more digestible scale, enhancing the qualities of a critical and obsessive imagination that distinguish his work. In ‘People in Glasshouses …’ 1990 a presentation case contained brass scrolls, each engraved with individual statements and carrying a crown-stamped seal. While the maxims and random cliches typed in the work and accompanied statements led the reader into a jungle of confused meanings, these did not detract from the persuasive impact of the work, and its further evidence of a new voice in sculpture.